“Bassy” Bob Brockman has a wide range of awards and credits, including more than 30 Grammy nominations with two wins, and an Oscar nomination. His many credits include Mary J. Blige, Toni Braxton, Brian McKnight, Faith Hill, Korn, Christina Aguilera, P Diddy, Santana, and Sting among many others. In this excerpt from The Mixing Engineer's Handbook 3rd edition, Bob discusses what he uses for plugins and his use of the mix buss compressor. "Can you hear the final product in your head when you begin to mix? Yeah, probably. I think that I probably make some subconscious and non-verbal judgements when I first hear a song. I make a judgement on style and then go through a couple hours familiarizing myself with all the parts, then I try to see what’s really crucial and what could be wallpaper. I then find whether there’s something that’s really important that I should make the listener aware of. The first 20 years of my career I had a producer standing right next to me, telling me what parts were important. It’s less so now because I see so fewer people. I get sent digital files and I sort of end up making those mix/production decisions on my own and end up delivering a more or less finished mix to the producer or the band, then I’ll get notes on what to tweak. Are you mixing on a console or in the box? I can mix in the box if I have to but it’s certainly not my preferred way of mixing. What I’m into is a sort of hybrid mixing. I have a Neve 8816 [analog console] with 16 channels coming out of an Avid 192 D/A with an Alan Smart C2 compressor across the mix buss. 16 channels of analog makes a big difference to me in terms of power and depth of field. I still do mix quite a few things in the box though, especially when I’m out traveling. How much of the DAW do you use? I’m very deep into the whole digital mixing process and do all of my work in Pro Tools. The plugins have stepped up a lot in the last few years, with the distortion and saturation plugs having improved immeasurably. They’re now more transparent and not adding a lot of phase shift or distortion when you insert them. That was my problem with plugs before and why I would tend not to use them on phase dependent things like drums and guitars. 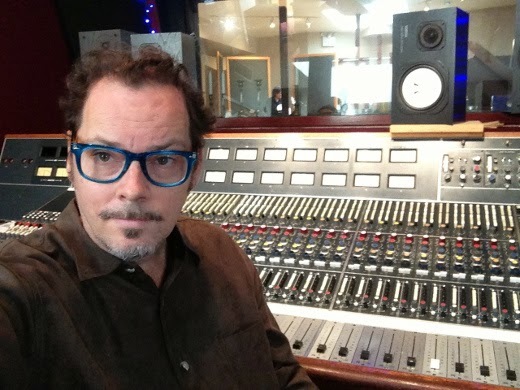 At a certain point, maybe the seventh or eighth hour the mix, the whole thing would start to sound crunchy to me, so I would go in and bypass the plugs and realize that I was using them as crutch to make things speak. Once you get things dialed in, by the end of the mix you don’t need them as much, so there’s a lot more sonic purity. I often encourage young mixers to bypass their plugs and listen to what they have, especially in a program like Logic where when you open up a session it’s already got three or four things inserted across every channel as a default. Do you have certain effects that you always set up before you begin a mix? I typically transfer all of my effects from one song to the next. I’ll usually use an [Soundtoys] Echo Boy or a [Massey] TD5 for delay. The [Waves] H-Delay and the [PSP] lexicon PCM42 are really nice as well. I usually have four or five delays which vary from very tight to slap delays to timed things. I tweak the timing so its either pushing or dragging a bit behind the beat. I usually have four or five reverbs all plugged in as well. I don’t have any analog effects processing. It’s all done in the box. I do have a pair of Neve 1073’s that I might insert across the stereo buss, but for the most part I’ll just leave the equalization to the mastering guy. I try to get the EQ and the sound from what I’m doing to the individual tracks in the mix. I’ve never been much of a user of equalization over the years. I’ve worked with a lot of master buss equalizers like the Massenburg stuff, but there are so many equalization things that happen to the sound just by making adjustments on the Alan Smart [SSL-clone compressor]. It’s such an amazing compressor with the way it grabs the low end and accentuates certain parts of the mid-range or upper mid-range depending upon how fast or slow and the ratio. I usually spend the last two hours of my mix not doing much mixing but listening and then making little adjustments to the master buss compressor and hearing what the impact is to all the parts. I definitely don’t have a stock compression setting. I’m always moving the setting around on everything that I do. Each song has to have it’s own contour I guess. How hard are you hitting it? That depends on the music. If I’m doing a dance record I’m probably hitting it pretty hard. If I’m doing an aggressive rock record then I’m sinking into it about 3 or 4 dB. If I’m doing something much more open or acoustic I’m barely hitting it. Most of the effect is how it’s putting the low frequency information in check, which it does without the meter moving at all. Even when you’re hitting it very lightly it still has a dramatic effect on the music." You can read additional excerpts from The Mixing Engineer's Handbook and my other books on the excerpt section of bobbyowsinski.com.